Yesterday we witnessed one of the most important American political traditions: the orderly, peaceful transfer of power from one presidential administration to another. Millions of Americans, from the National Mall to homes across the country, watched as Donald J. Trump took the oath of office to "preserve, protect and defend the Constitution of the United States." And as only forty-four others have done, President Trump addressed the nation as our Commander-in-Chief and leader of the free world. I was there to witness this historic event and reflected upon what this moment represents: a new opportunity to enact positive change. 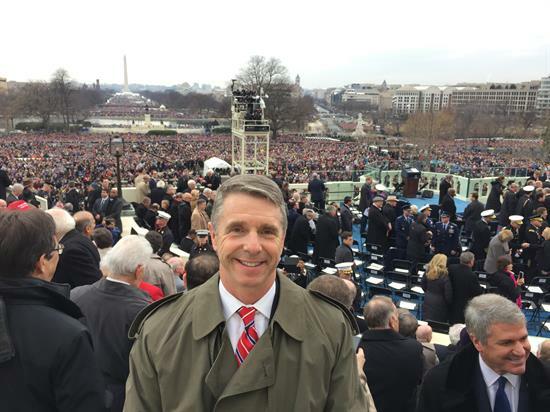 As I sat amongst the leaders of our nation on the inauguration platform, I felt even more inspired to do what the people elected me to do: get the work of the nation done and be an advocate for Virginia's best interests. I am eager to work with the Trump Administration, and my colleagues in the House, to pursue a bold agenda that increases prosperity, boosts job growth, gets our budget back on track, reaffirms our commitment to our nation's veterans, and strengthens our military. We've already taken the first steps in enacting that agenda by putting in place the process to repeal the failed Affordable Care Act and replace it with healthcare reforms that actually increase access to care, improve quality of care, and reduce costs. In the weeks and months ahead, we will also work to improve our tax code, reduce the regulatory burdens holding back small business growth, and strengthen work requirements for welfare, among others. I also believe yesterday marked the end of business as usual in Washington. And I plan to do my part to ensure Congress and the federal government work for you, and not the other way around. I remain committed to reforming how Congress works by enacting No Budget, No Pay, a bill which would prohibit members of Congress from receiving paychecks if their respective chamber doesn't pass a budget resolution by mid-April, and the Stay on Schedule resolution, which would prevent the House from taking a vacation in August when critical bills funding government operations remain to be passed. In President Dwight D. Eisenhower's first Inaugural Address in 1953, he said, "It is because we, all of us, hold to these principles that the political changes accomplished this day do not imply turbulence, upheaval or disorder. Rather this change expresses a purpose of strengthening our dedication and devotion to the precepts of our founding documents." And the same is true at this inauguration. We must use this change to renew our commitment to our Constitution and founding principles. I pledge to stay true to these ideas to bring lasting, positive change to restore confidence in America again. Who will be hurt by repeal of the Affordable Care Act? EVERYONE.